The 40th annual Devils Lake Chamber walleye tournament June 24-25, has over $60,000 in prizes up for grabs. 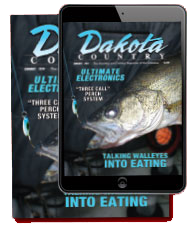 The North Dakota 2-person team event is a first-class affair for anglers with a $5,000 guaranteed first place cash prize and more than 10 times that in other special cash and merchandise awards. Space for this popular tournament is still open; teams should register soon at devilslakend.com. Last year’s walleye winners with 48 pounds were Travis and Mike Kaderlik. The father-son team from Mankato (dad Mike), MN and Bismarck (son Travis), landed about 200 walleyes, but didn’t keep any unless they measured at least 22 inches. They cast Rattlin’ Raps and Jointed Rapalas in 2 to 10 feet of water over and through weeds in the Pelican Lake section of Devils Lake. 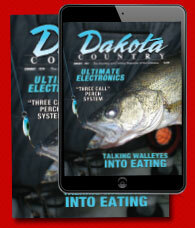 Devils Lake walleye chasers love the lake because they can usually catch fish with their favorite tactics. Casting crankbaits like the Kaderliks did is very productive near shorelines and weedbeds. Anglers also jig with live bait or the many excellent plastic “minnows.” Trolling from shallow to deep water is very popular, as is bottom-bouncing and Lindy rigging. One of the Devils Lake techniques that always seems to put fish in the livewell is slip-bobbering with leeches in and around flooded timber. The weigh-in ceremonies hosted by tournament director, Devils Lake guide and world champion walleye angler Johnnie Candle will be streamed live from Graham’s Island State Park. All team members receive a Cabela’s jacket, and are eligible for daily big fish prizes. New this year is Ranger Cup status. Only the top tournaments nationwide qualify. Registered Ranger boat owners are eligible for cash depending on their finish. As an incentive, if both team members are under 21, the entry fee is $235, compared to the normal $275 fee. A kid’s fishing clinic is set after Saturday’s weigh-in at Graham’s Island State Park with 50 rods and reels to be given away. The latest fishing and tournament details can be found at devilslakend.com. The website features a list of fishing guides, lake, ramps, fish-cleaning stations and fishing conditions, events, resorts, lodging and restaurant news plus a helpful map. At the tournament, shoot pictures for the Coolest Cooler Giveaway contest, with details at the website. For tournament questions or tourism information, call 701-662-4903.